Looking for subtraction flash cards just for kindergarten? Well, here you go. These small sets represent the Common Core Standard for kindergarten to fluently add and subtract within 5. 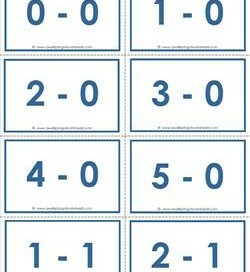 Sticking with the basics, these are divided up by each number between 0 and 5 and also come in a complete set. They come in basic black & white and color versions so you can easily separate the facts by 1’s, 2’s, etc. Please go to this page to choose from all the kindergarten subtraction worksheets and resources on this site. Okay, so these are super easy … at least for us grown ups. 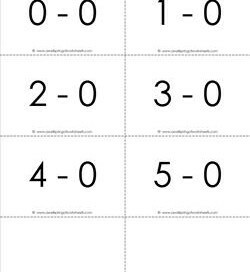 A black and white set of 6 subtraction flash cards for 0’s for the numbers 0-5. One page. 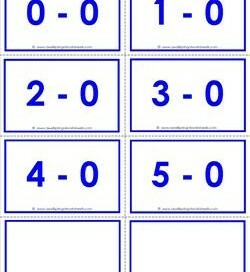 Start learning subtraction facts with this set of 6 blue flash cards for 0’s for the numbers 0-5. 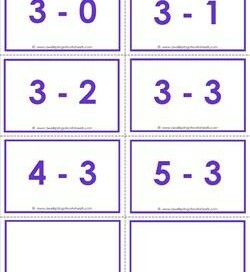 Great for learning subtraction facts in small sets. Here you go! 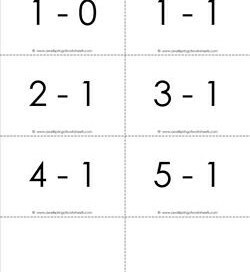 A set of black and white subtraction flash cards for the 1’s for numbers 0 to 5. Perfect for center time or at home practice. 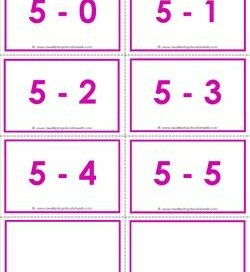 Now we’re stepping it up a bit by providing these subtraction flash cards in color! Six cards for subtracting 1 or subtracting from 1 in a pretty green. I love 2’s. Maybe because it’s fun to count by 2’s. Subtracting 2 is a whole different ball game. 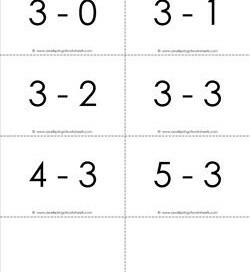 These subtraction flash cards will help you do just that! 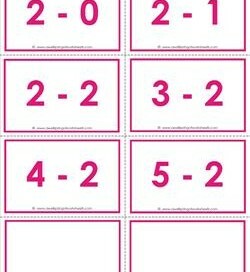 These six subtraction flash cards for the 2’s come in a pretty berry color. Use the blank cards to create more subtraction problems of your own! Plain and simple. That’s what I like to call my black and white sets. Save on color printer ink! These are six subtraction flash cards for the 3’s. These luscious purple colored subtraction flash cards for the 3’s will brighten things up and make learning subtraction facts for 0 to 5 a little more fun! Whoever said black and white is boring? Black and white is classy. 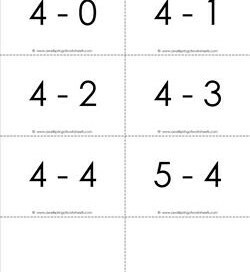 So please, enjoy these six classy subtraction flash cards cover the 4’s between 0 and 5! 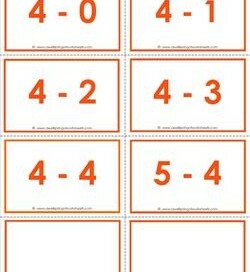 Orange is for rainbows and pumpkins … and these subtraction flash cards for 4’s! Six flashcards for the 4’s in a size perfect for little kindergarten hands. Do things in black and white remind you of old fashioned movies and pictures? Well, these subtraction flash card facts for 5’s are as old as the hills! Thinking of spring? I’m not either, but it is my favorite season and these lilac colored subtraction flash cards for the 5’s remind me of spring and new life. 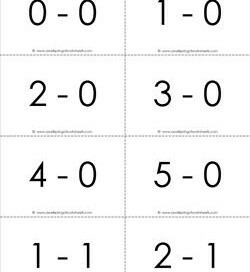 This is a complete set of subtraction flash cards for every subtraction problem between 0 and 5. Use with caution. You may get really smart! Hope you enjoy this complete set of subtraction flash cards for every subtraction problem between 0 and 5 in a welcoming blue.